Our TOP 4 reasons why we LOVE dragonflies. They eat mosquitoes. They have well earned the nickname, the mosquito hawks. They don’t bite, they don’t string. In fact, they might come and just sit with you! They are the most adorable insect ever! Did I mention they eat MOSQUITOES? This past weekend marked the unofficial start of summer and we didn’t miss this opportunity to enjoy the summer weather. 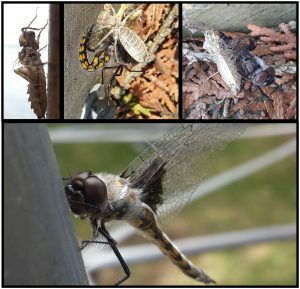 Apparently the adult dragonflies agreed as they choose this weekend to emerge. 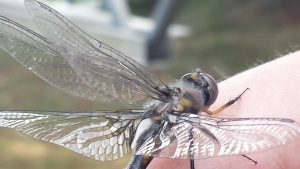 By pure accident, we discovered a dragonfly hatching from its nymph skin. Molting one last time. And we suddenly became researchers in the field. Biologists! Entomologists! We watched and watched for hours, as Dan (named by my kids) pushed its way out leaving its nymph shell behind. We found many other newly hatched ones, letting their wings and body dry and harden in preparation for flight. 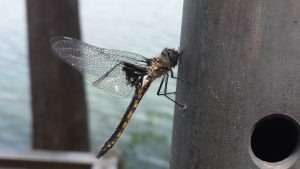 Then we watched as the dragonflies gathered to dance in the sky, like the Snowbirds at an air show, showing that they are the masters of flight. It was pure magic! And we had front row seats! 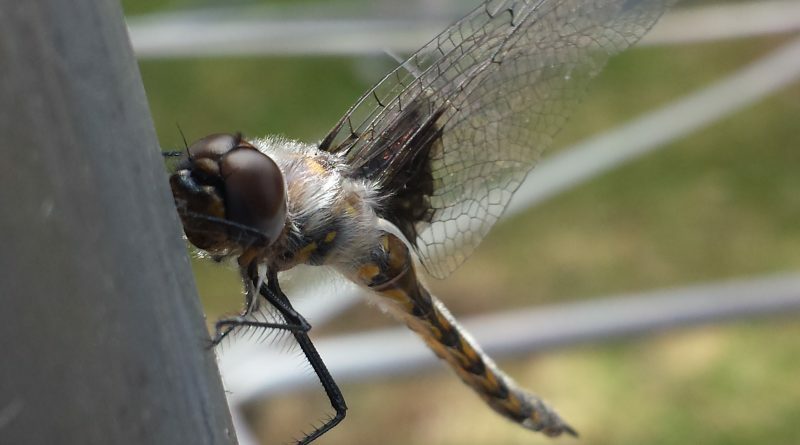 Before there were dinosaurs, there were dragonflies. That’s 300+ million years ago! After the eggs hatch, they start their lives out as nymphs living only in the water. They have amazing eyesight, their 30,000+ lens give them 360° vision. They only catch their prey while flying. (So our attempt to feed one sitting on the log was not productive). They live as nymphs in the water for about 2 years. Only venturing to dry land when it’s time to become a grown-up. They have great precision and accuracy catching their prey. They are excellent hunters, and rarely miss their target. Take that mosquito! ← The Aquatarium is Aquamazing!